CCP Games is known for their successful, slightly insane Sci-Fi MMO, EVE Online. The game is exclusive to PC, and sees players fighting for dominance in massive spaceships across a single, shared universe that’s home to hundreds of thousands of players. When they announced that they were developing a new title, a free-to-play first-person shooter for consoles wasn’t the first thing that came to mind. 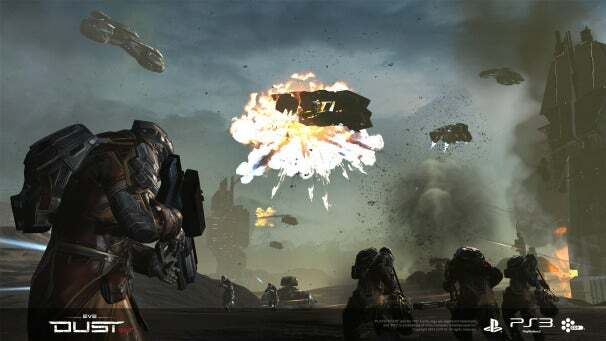 But DUST 514 is coming: I was given some hands-on time with the game at CCP’s Fanfest 2012 last week in Reykjavík, Iceland, and it surprised me in more ways than one. DUST 514 isn’t your typical first person shooter. It's linked directly to the EVE Online universe, and DUST 514 players on the PlayStation 3 will be fighting for (and against) EVE Online players on the PC, conquering territory and etching their names into the games rich, player-driven lore. Contrast that with the standard jaunt in something like Call of Duty, where you'd fire up your Xbox 360, shoot at friends and foes for a few rounds, and then hop offline to go eat dinner. In DUST 514, your actions will mean something in a grander universe. Countless developers have spouted this line as a way to get people interested, but CCP showed us how this is true in relation to EVE Online. One of the cornerstones of EVE Online are player-run corporations. Players are responsible for everything that happens in the EVE Universe, driving conflicts by battling over territories and resources. Corporate espionage and betrayal are commonplace. And it’s a big deal, as the player-driven economy means that every conquered system means someone else is denied precious resources. Players will interact with each other in ways that an FPS and MMO have never done before. That may sound like PR-speak, but it’s true. As we filed into the beautiful theater at the Harpa Opera House, we were told that we would be given a demonstration of what made DUST 514 different from every other first-person shooter. The demonstration stuck to the formulaic demo that is usually shown at events like this, but then something unexpected happened. The developer playing the game on stage asked another developer to join; instead of picking up a Playstation 3 controller, his helper took command of a PC. The presentation display went to split-screen: one side showing DUST 514, the other EVE Online. As fans began to whisper, the presenter mentioned that they took a shared contract before the demo started and that they were in a temporary alliance. 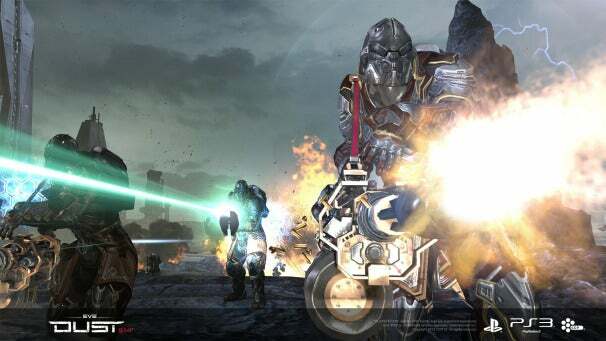 The player in DUST 514 targeted a large group of enemies defending a single location for an Orbital Airstrike. A target appeared, and the EVE player fired on the planet from his ship. The audience went wild as shots came down from the sky, destroying everything in the targeted zone. Players in completely distinct games, working together to accomplish a singular goal: this is rare, if not a first. And CCP noted that this was something that they implemented for the first time in the office a few weeks prior; and that their ideas for cross-platform combat are aimed far beyond bombarding console gamers from space. While the core gameplay of DUST 514 isn’t as revolutionary, it felt as though it will be able to hold its own among the annual Call of Duty and Battlefield releases. I played a traditional team deathmatch, but the core game type will see players capturing terminals so that their team's mobile command vehicle can dock on the map, while depleting the defending team’s reserve of clones. Clones are central to EVE Online’s lore: players in EVE and DUST 514 are ostensibly immortal, transferring their consciousness to a new body upon death. In DUST 514, teams will have a cap on the number of clones you can bring into a battle. Once you’re out of clones, you won’t be able to respawn, all but ending a match. Dropsuits and central to combat. They're DUST 514’s take on traditional first-person shooter loadouts, offering a range of bonuses to mobility, defense, and weapon capacities. An assault dropsuit will allow you to be nimble, but a heavier dropsuit will offer better defense, and the ability to carry larger weapons. Players can fully customize their dropsuits, and this is where the microtransactions come into play. CCP insists that the game won't devolve into pay-to-win scenarios, but it was tough to get confirmation on just what exactly players would be able to purchase. 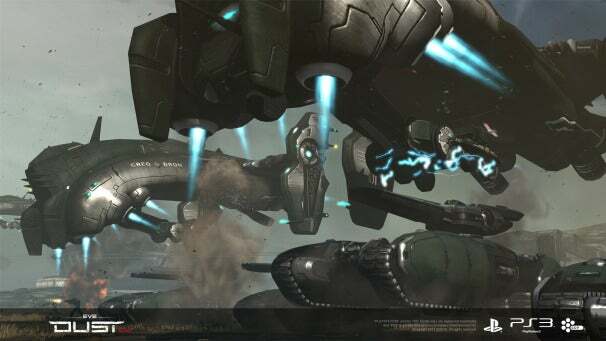 The large player count –24 vs. 24 was announced– lends itself well to DUST 514’s vehicles. I saw three vehicle types (Light Assault Vehicle, Heavy Assault Vehicle, and an aerial Dropship), and each felt that it had a very unique purpose that depended entirely on the situation at hand. That said, there are some major issues in DUST 514 that simply scream “we’ve never made a shooter before.” In all three of my play sessions, it was incredibly difficult to kill enemies –and no, it’s not because I’m bad at games. It’s unclear whether this is a simple balancing issue, but when you’re standing in front of a player and shooting them in the face with rockets, and they still won’t die, something is amiss. Vehicles and ground combat also suffered from wonky control schemes. While there isn’t necessarily a right and wrong to designing a game’s controls, they felt clunky. Consider weapon swapping: instead of pressing triangle to switch weapons, players must hold the right trigger then use the right stick to navigate a menu, then let go of the right trigger while still holding the right stick in place before the weapon would finally switch. It was a bit over-the-top. Fortunately DUST 514 has yet to hit Beta, so there’ll be some time to sort those issues out. The poor balancing and control choices almost soiled an otherwise solid first experience with DUST 514. If not for the connectivity with EVE, it would have come off as somewhat generic. But the concept of intertwining a PC MMO with a first-person shooter is so striking that I can’t wait for it to hit the market and see events unfold. The idea of corporations forming in DUST 514, and eventually getting so large and successful that they join a corporation from EVE Online is crazy, but in the most exciting way possible. It’s good to see that CCP and Sony are investing so heavily in this idea, and aren’t shying away from innovation or the idea of merging groups of two completely different players. I just have to hope that the issues I saw are fixed in the closed beta, whch launches in April for Fanfest attendees, and June for everyone else. I can’t wait to see where DUST 514 goes from there.